The most complex computer simulation of its kind to date suggests that melting Arctic ice is significantly contributing to extreme cold weather in the Northern Hemisphere, with last winter’s Polar Vortex that swept the North American east coast serving as an example. Moreover, the analysis suggests that global warming has actually doubled the risk that any given winter will be unusually harsh in Europe and Asia. It may seem counter-intuitive that global warming, which is typically associated with increased atmospheric temperatures, is actually helping winters grow colder and fiercer, yet there’s been a growing body of literature to support this idea. A new study lends further credence after Masato Mori, from the Atmosphere and Ocean Research Institute of the University of Tokyo in Japan, and colleagues made the most comprehensive computer modeling study to date that looked at the connection between Arctic ice loss and freak weather in the Northern Hemisphere. For their output, more than 100 different simulations were performed, as reported in Nature. Mori and team looked at what happens when ice is low in the Barents-Kara area, located off the east-northeast of Norway and Russia, and when it is high, using sea ice levels based on actual observations made since 2004. The Arctic, which unlike Antarctica doesn’t sit on a landmass, has been steadily losing ice in the past couple of decades and is expected to completely melt by 2030. The simulations show that less ice leads to more heat becoming absorbed by the open ocean waters, which alters pressure patterns and air circulation in the northern hemisphere. Ultimately, colder Arctic air is moved southward and creates what are called blocking patterns, where the atmosphere effectively gets stuck in a particular pattern for days or even weeks. This is why bouts of extreme weather and colder temperatures in North America, Europe, and northern Asia can occur. In fact, the models suggest that ice loss in the Arctic led to a doubling of the chances of a cold winter over Europe and Asia. 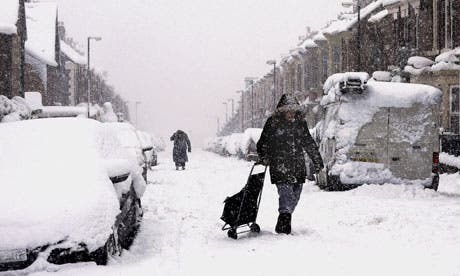 “The agreement between observations in the real world and these computer models is very important in giving us more confidence that this [doubled risk of severe winters] is a real effect,” Professor Adam Scaife, a climate change expert at the United Kingdom’s Met Office who was not part of the research team, told The Guardian. Last year’s winter, though harsh, wasn’t the coldest on record. In fact, it was pretty average historically. So, why are we talking about this? While the climate is notoriously variable, you can very well treat this variability as noise. The fact is that frigid winters have been happening with a regularity that defies historical projections, and now this observation seems to be confirmed by climate simulations. Yet, again, variability has it’s role to play. Mori says sometimes natural variability is the overriding factor influencing the atmosphere (such as the winter of 2009-2010), while in other years, the sea ice decline is the main driver (for example, the winter of 2011-2012). In other years, such as from 2005-2006, a combination of the two is at play, he said. Of course, this is not the last word on the subject – more research will have to further establish if this link exists, and if so how strong it is. “The analysis of the observations is sound and the modeling results look to me to be dynamically plausible, though I still find it hard to believe that sea ice anomalies over a such a small patch of ocean . . . could influence climate over such a large expanse of Eurasia,” said Mike Wallace, an atmospheric scientist at the University of Washington and the co-author of a letter in the journal Science earlier this year arguing that while the link between sea ice decline and extreme weather was worth exploring, it was receiving too much attention in the public discourse than the evidence supporting it should allow.